The Golden Pavilion Temple, also called Kinkaku-ji in Japanese, was built in 1397 and it is located in Kyoto, Japan. It was initially made to serve as a villa for retirement for Shogun Ashikaga. It was quite later that his son converted the building into a Zen temple. 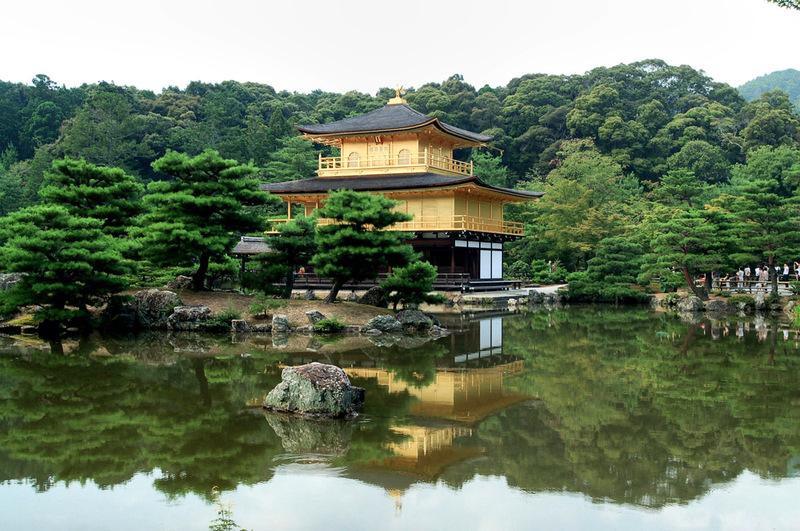 The Golden Pavilion burned down in 1950 when a monk set fire to the temple. The Golden Temple is a building with three stories. The upper two stories are covered with a pure gold layer. The main purpose of the pavilion is to work as a shariden, storing relics of the Buddha. One can see a typical Chinese architectural style on the top floor. The second floor has a Zen style and the ground floor is made in the shinden-zukuri style. The entire temple is surrounded by a beautiful garden with a pond in the front called the Mirror Pond. The stones in the pond give a representation of the Buddhist era. In the year 1987, some parts of the temple were recoated in thicker gold and some of the interior of the temple was remodeled in 2003. Lovely picture, they pciked the perfect time to take this. The pond contains many large and small islands. Climbing a few steps, you stand at the edge of another small pond, An-min-taku. The small stone pagoda on the island is called Hakuja-no-tsuka (the mound in memory of the white snake). We were there in May, 2014. Lovely place!